Aylesbury Football Club have published a heartfelt tribute to Danny Martone, after he sadly passed away earlier today. Former Bucks Herald sports editor Damien Lucas, has fond memories of Martone. "Having worked first as sports reporter and then editor for many years on the Herald I was in regular contact with Danny and enjoyed a good relationship with him but my memories of him stretch way back to playing against his Stocklake and Vale teams as a kid. "Danny could be quite a divisive figure because he knew what was best for his teams and when he set his mind to something he was not for turning and actually it is probably that characteristic I admired most about him. "I he wasn't happy with how something was written or portrayed he'd be the first to let you know, but he understood the importance of working with the local paper and embraced it, always pushing for his team to have more coverage. "I'm yet to meet a man more devoted and dedicated to the betterment of football in Aylesbury. A fun guy and someone who saw some of the most talented youngsters in Aylesbury pass through his various teams. I remember our old Under 18s team had a big rivalry with his Belgrave side and when we played them in the Berks and Bucks Cup final there was a massive crowd. Danny was desperate to beat us but even though we ended up winning he was the first person to shake all of our hands. He will be sorely missed, my thoughts go out to his family and friends." "The Club is sad to announce that former Chairman and ‘Mr Aylesbury FC’ Danny Martone has passed away. "Many of you will know of his recent struggle against illness and Danny was admitted to the John Radcliffe Hospital last week where he passed away last night with his family by his bedside. "Danny was the face of Aylesbury FC, without him the club would not exist. With his larger than life personailty he could never be ignored. Players and officials alike would be told of their faults when they entered the boardroom, but always with good humour and grace, followed by tales of his playing career. Danny has been involved in football all of his life, playing in goal as a scholar for Oxford United and eventually after a number of injuries curtailed any thoughts of a professional career, in the green and white of Aylesbury United's reserve side in the late 70s and early 80s. "Danny became involved with the club at the start of the 2000/2001 season when the senior Belgrave FC team was renamed Haywood United following an amalgamation with Stocklake FC with Danny being voted in as Chairman of the new club. Haywood United joined the Spartan South Midlands League and won promotion into Division One after two seasons. Notable achievements during the 2001/2002 season included league awards for the best kept and most improved ground; this included the erection of floodlights and perimeter fencing, which Danny and his hard working committee fought hard to establish. The club gained another award for the match day programme in recognition of how much it was developing under Danny's stewardship. "In 2004/2005 the club entered the FA Cup and Vase for the first time and won the Buckingham Charity Cup in 2006. "Haywood United became Aylesbury Vale FC in 2006 as Danny moved forward in his ambition to see the club represent the town and to bring on good local players to play for the side. May 2009 saw a major development in a new semi professional side as Aylesbury Football Club was formed. 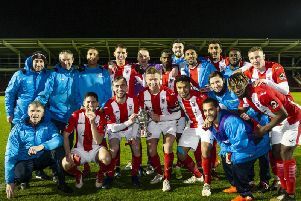 Great success was to follow, masterminded by Danny, with the team having a fantastic run in the FA Cup, finally being knocked out of the competition by Wealdstone in a close game. A brave and superb display was witnessed by a bumper crowd of 800 plus. "In 2015 the club won its first major trophy, beating Chesham United in the Berks and Bucks Cup Final, something Danny was so proud of. "Aylesbury Football Club prides itself on clear ambitions that were founded and driven by Danny, to progress to higher league football and to achieve higher league status with squads from local talent. The club hopes to continue the work started by the former Chairman with other local community groups and enhance the clubs facilities to benefit the people within Aylesbury. "The thoughts of everyone at the club are with his family at this time, Danny will be missed by everybody."